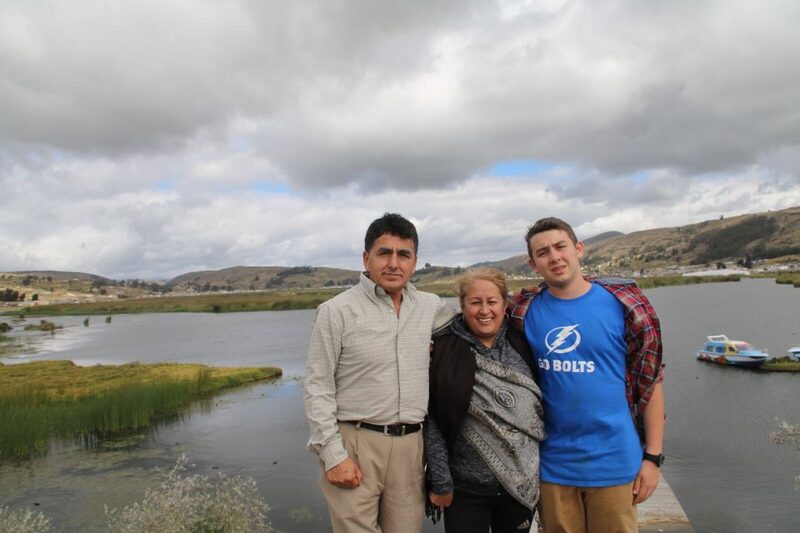 The homestay in Riobamba was an incredible experience that I will never forget. My family was incredibly nice and hospitable, so I immediately felt welcomed in their household. My family was also very close and I truly felt as though I was part of the family after only one week. I was able to meet many of my older host brother’s friends who were all very interesting and funny individuals. My younger host never failed to make me laugh and my host parent always made me feel right at home. I had so much fun playing soccer and basketball with my host family and the food was incredible. Throughout my homestay I was able to learn so much about Equadorian culture, particularly certain sayings unique to Ecuador or things that aren’t common in the USA. 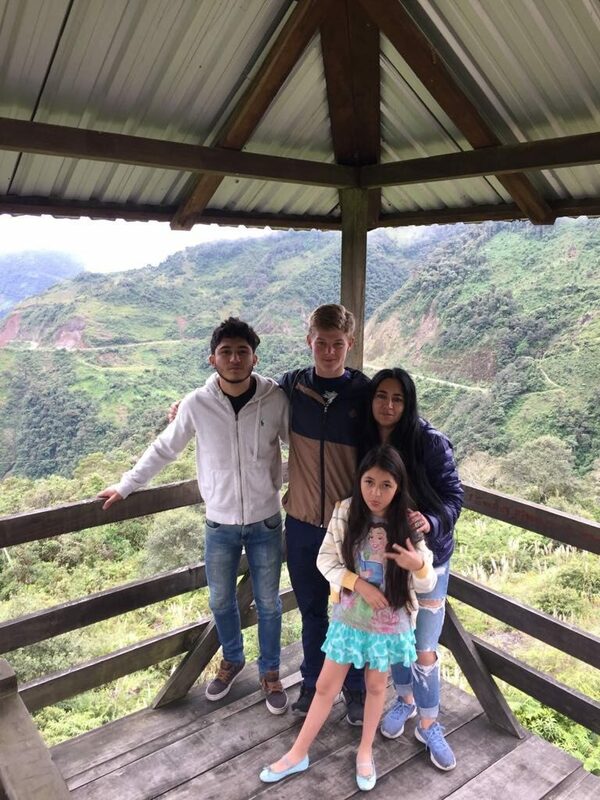 I loved every moment I spent with my host family and I hope to return to Ecuador in the future to see them again. 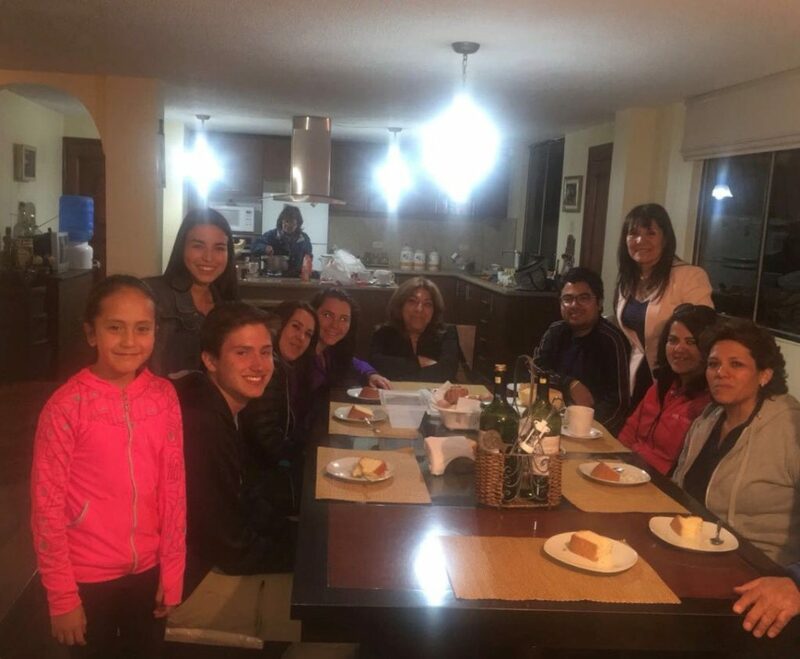 The homestay in Riobamba was a life changing experience. My family was the nicest family I have ever met. The food was great and they treated me like another member of their family. My home in Ecuador was a home away from home. I also had the chance to meet a new friends. I will never forget my loving family or the kind people of Ecuador. I had a great time and I will make sure to visit in the future. This week we had our homestay and it was quite interesting. My new family consisted of my mother and her son who was 16. He would often take me out with his friends. This was fun and surprising because I would never know exactly where we were going or for how long. Sometimes we’d be out for hours, sometimes we would just grab some food and go home. Another thing that I found interesting was the amount of family and friends that would come in and out of the house, which was fun and different than the United States because usually families don’t come over to visit several times a day. During the homestay we also climbed Chimborazo which was super cool but also very cold and windy. We got great views and had a great experienceafter the difficult hike. Overall I had a great homestay experience and my Spanish has improved a lot! My homestay in Riobamba was a fantastic experience. 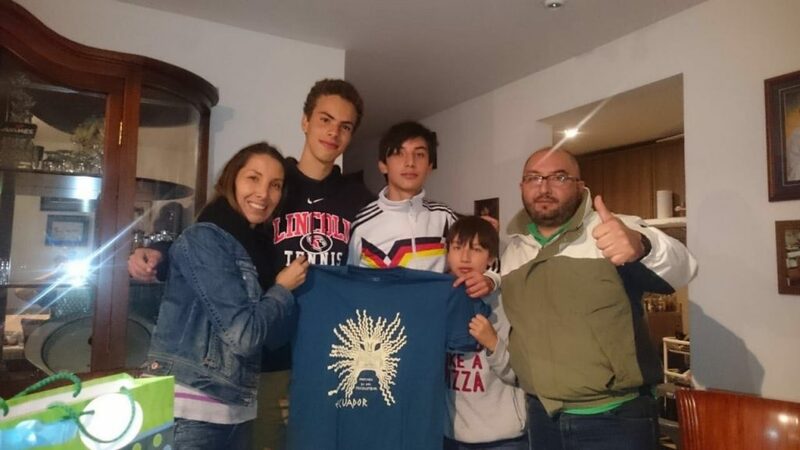 It allowed me to connect with new people, from new friendships, grow the boundaries of both my knowledge of Spanish and of other cultures. My family was very close, and the kindness and caring nature that they showed to both me and other family members was incredible. I was able to live my life differently, and see the world through the lens of a different culture. I loved spending time with my younger brother playing soccer, and working at my host dad’s hat shop. Seeing the way that people do things differently here also allowed me to reflect on my own life in the US. 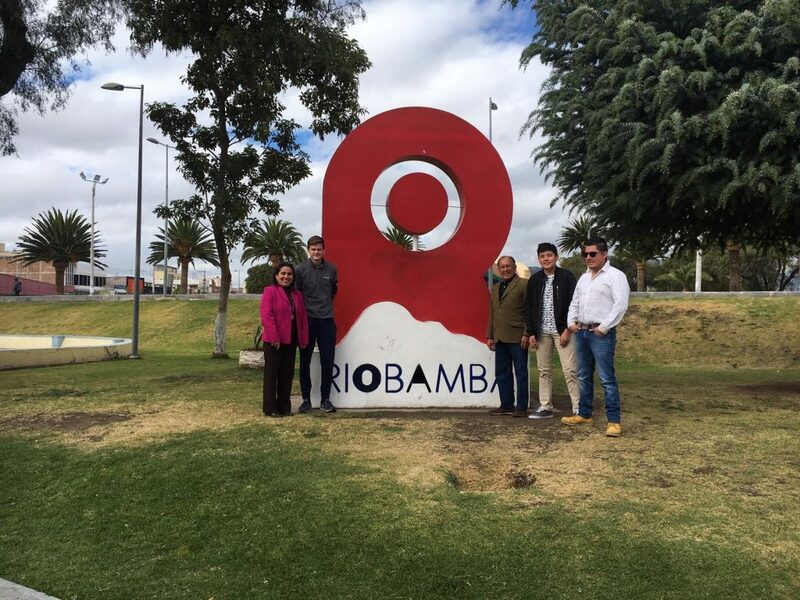 My family and I laughed, watched the World Cup, ate meals, and explored Riobamba, all together. It was amazing to see how even in a culture different from my own, the same feelings of love, kindness, and a caring nature made me feel right at home. Family is a regular term we use for those closest in our lives. One that is difficult to change. When meeting my host father there was a deep connection from the start. Every minute he had free he would spend with me. My brothers and I got along very nicely, my older brother Josue(17) was always there to translate my broken Spanish into something more applicable for my parents, and there was my younger brother Sebastian(14) who never failed to give me a smile. Finally, my mom, who called my her son from the Start. “Aloha mi Hijo.” We would always visit after she had finished teaching at the school. Every word I said in Spanish would have my mother burst out in laughter from my accent. Everyday with my family was action packed. Although I was not able to comprehend everything in Spanish, I always made it back home. Some days I was teaching at my brothers English class, or photographing llamas in a farmers field. It was as if my family always knew me. After a week it was hard to leave this wonderful experience, but I knew for the rest of my life they were part of my family.